Intro Flash Caps go here ! Updated and complete!!! Topic: Intro Flash Caps go here ! Updated and complete!!! Re: Intro Flash Caps go here ! Oh its like a monkey off my back, all this time I was looking for a man ! Few sources have said that the race continued to Belarus after Finland. And I don't think it was just a connection point. Nice one puddin. Looks like our "golden boy" turned out to be a "silver girl". This find raises puddin to the "La Puesta Del Sol" level of TAR detectives. (a rare breed indeed). You absolutely rock. Are we done here? I put it into Wikipedia for you Puddin. Now we know where the whole "Belarus/Estonia" rumor came from...they went to Ukraine instead...which of course is nextdoor. I'm just glad we got the location fixed before it happens or umm...I mean in TV time not real time . 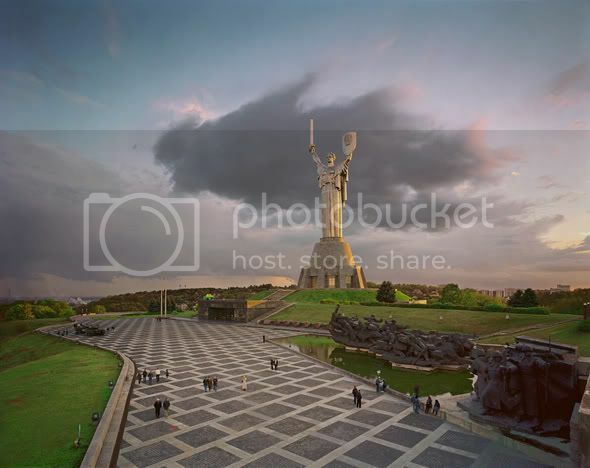 I mentioned in another post that my parents live in Ukraine -- I even THOUGHT about the Statue of the Motherland but thought -- "no, it's silver." YEAH, PUDDIN!!!! BTW, you can climb that statue -- my dad has done it. Possible roadblock? I have been waiting for them to go to Kiev forever! Woohoo! Can't wait to do some spoling with new clips!! Great mwooden! any ideas of why it looks gold? I'm having a hard time finding a picture or reasons why? mwooden can you give us a timeline update when you have time? heres one picture, sort of goldish..is it the sun playing tricks? New route spec in the spoilers thread, Puddin! Also, yep, think it's just a lighting thing that's making it look gold. So that I could help in the Google-ing soon. Hate to be a wet blanket, seeing as how we have all the intro caps pegged now, but that tank isn't at the museum in Kiev. I've been to that museum a couple times and there's no terrain like that (mud, pines) anywhere around that area. The tank very well could be Ukrainian, but it's not at that site. I questioned the tanks mwooden, it was just a guess. No problem. Just search for an armored unit or tank proving ground nearby (it might be a museum, like the Dennis/Andrew FF, but...I doubt it). Until we can read the uniform (I've had no luck with the patch so far), that's about as close as we're going to get, because the pine forest and mud are generic. Now onto some info regarding the tanks, DH sent me this link in this regard. It appears that just 43 little miles from Kiev is Desna Military Base and for a price, people can shoot, drive a vehicle or live like a soldier. Glad to be posting here and thank you all for the great spoilers!! Welcome aboard MrsEbbles ! I just checked out the link and DH's lead is looking good ! He looked at the tank picture with driver that's upthread and recognized the tank (despite it's added-on greeblies) and knew instantly that it was Ukrainian. He couldn't figure out the patch due to it being too blurry. He then found some pictures of various models of the T-72 and T-80 Russian tanks but just sent me this link to the article instead. I can post the pictures he found if you like. Ahhh, the joys of being married to a man who loves TAR! From AK-47 assault rifles to T-72 tanks and Mig-29 fighter jets, Ukraine is offering anyone with money to burn the opportunity to fire, drive and fly the same military equipment that during the Cold War was on hair-trigger alert for a NATO attack. The tank in the credits is a T-72. Nice MrsEbbles,we hope you and DH stick around an post with us ! Now are we done here? Desniansky firing range (50 km from Kyiv). Angarsky firing range (Simferopol, Yalta region at Crimean peninsula). Uzhgorodsky firing range (20 km from Uzhgorod). Yavorovsky firing range (70 km from Lviv). Nice work, Mrs. E! Intro caps are done! Looking forward to D/K with a grenade launcher. Just adding a pic from the Alaris site Slowhatch put up -- looks like our tank and our terrain. Can't determine which of their locations this pic comes from, but since the pitstop is in Kiev, can't imagine they'd go any further than Desniansky. Yep, think those falls are a match, qingher! Re: Intro Flash Caps go here ! Updated and complete!! !